Background: Leishmaniasis is a protozoan parasitic vector-borne disease which is endemic in 88 tropical countries. Infected sandfly is the main vector of this disease, while there are several other vectors, parasites, and reservoirs involved in the transmission of this disease. Leishmania donovani, L. infantum, and L. chagasi are common disease causing species, transmitted through sandflies. Leishmaniasis is a neglected tropical disease with broad spectrum of clinical manifestations. Cutaneous leishmaniasis is prevalent in many countries, including Pakistan. Methods: Thiocarbohydrazones (1-20) were synthesized through one pot method by refluxing thiocarbahydrazide with different substituted benzaldehydes in ethanol in the presence of acetic acid as a catalyst. These synthetic compounds were evaluated for their potential antileishmanial activity in vitro against Leishmania major promastigotes. Results: Compounds 5-8, 11, 14, 16, 17, 19 and 20 were reported earlier, while compounds 2-4, 9, 10, 12, 13 and 15 were identified as were derivatives. 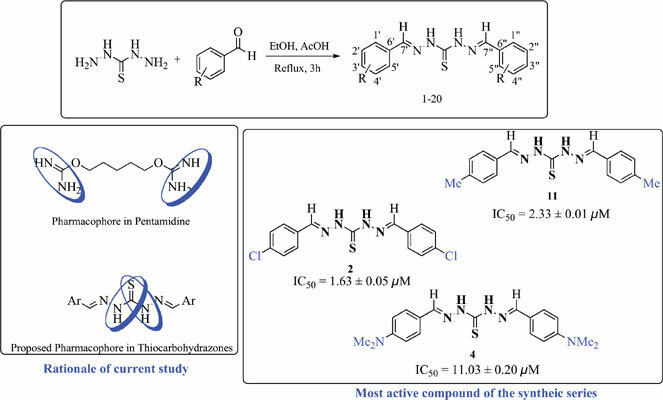 Compounds 1-20 demonstrated antileishmanial activities with IC50 values between 1.63 ± 0.05 - 64.82 ± 0.17 µM, as compared to the standard drug pentamidine (IC50 = 5.09 ± 0.04 µM). Compounds 2 (IC50 = 1.63 ± 0.05 µM), 11 (IC50 = 2.33 ± 0.01 µM), 4 (IC50 = 11.03 ± 0.20 µM), and 10 (IC50 = 11.63 ± 0.06 µM) displayed comparable antileishmanial activities to the standard drug pentamidine. However, compounds 13, 15-17, and 20 with IC50 values 36.95 ± 0.025, 64.82 ± 0.17, 64.27 ± 0.38, 62.34 ± 0.38, and 40.47 ± 0.05 µM, respectively, showed a moderate antileishmanial activity. In contrast, compounds 1, 3, 5-9, 12, 14, 18, and 19 demonstrated less than 50% growth inhibition of promestigotes of L. major, and thus considered as inactive. Conclusion: In thiocarbohydrazone derivatives, different substituents at aryl part may be responsible for a varying degree of antileishmanial activity in vitro. Consequently, these compounds might have a potential for further studies as a new class of antileishmanial agents. Thiocarbohydrazones, leishmaniasis, antileishmanial activity, Leishmania major, pentamidine, structure-activity relationship.